- After you’ve gained control of the Institute, wander around the grounds for a while. Eventually a few NPCs will point out that something is going down in Institute BioScience, and you should go have a look. - Newton Oberly is there, and he’ll tell you that two scientists in BioScience are protesting your appointment as head of the Institute by locking themselves in their lab and refusing to distribute food. How adult! Oberly will open a door next to you and let you into a series of side passages leading into BioScience. He’ll also give you the BioScience Systems Access Holotape, in case words don’t do the trick. Disable Turrets. Obvious enough. This shuts down the Turrets in the previous hallways. Initiate Specimen Release. This will release Gorillas into the room. They will kill everyone inside. Not a terrible idea, but move quickly - they want to take you down, too. Once inside you’ll have to take a Password from Lawrence’s body to open the main door. Open Door. This will pop open the nearby door and let you into the room. You’ll face a room of hostile Synths. Gunfight? Inevitable. The two scientists will cower in a corner, and speaking to Lawrence once the Synths are trashed will prompt Max to surrender. - If the two guys died then the matter is more or less settled. If not, you get to choose their punishment - and you can opt to have them executed, if you’re persuasive enough. 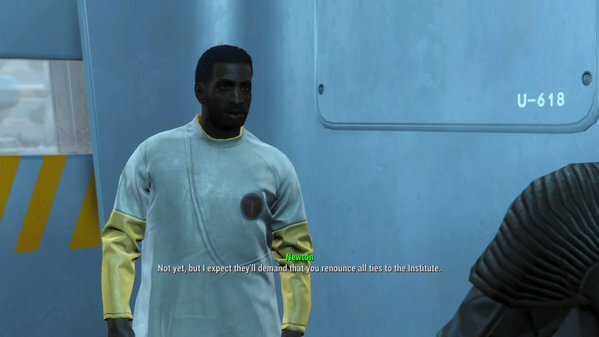 Assuming they survived, you’ll get some chems for completing the quest and kicking them out of BioScience.